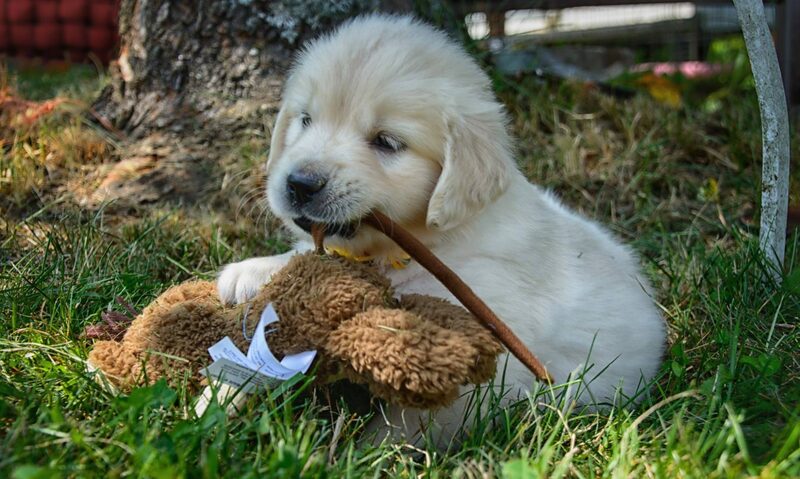 We are dog lovers and entrepreneurs that specialize in quality Golden Retriever puppies. We are located in beautiful New England; in Hampden, Maine. We like to consider ourselves collectors, if you will! We breed both British Cream and American Standard Golden Retrievers. Our British Cream (aka Euro Cream) retrievers are almost pure white, with some light shades of tan. The American Standard Golden’s are shades of browns, reds, and tan colors. We work with only Golden’s of the highest quality with very high standards. We do invite you to compare, and ask any questions you may have as well. Our Golden Retrievers are happy, healthy, obedient animals of only the highest quality! Our program concentrates on the traits of the family dog first; health, trustworthiness, gentleness, loyalty, beauty and longevity. Then, we incorporate the correct and proven genetics, imported and genetic lines that are proven through generations, not by just a few individuals, to pass on the history of the breed to their offspring. Show champions along with champions of the field events. These bloodlines are gathered from around the world! We utilize Eastern and Western European lines such as, Polish, British, English, Hungarian, Swedish, English, French and Russian gene pools in our imported Golden Retrievers. This results is an European bred Golden Retriever that is very beautiful, strong, athletic and extraordinarily capable and willing to please. These are wonderful animals with the history of the breed embedded in their very soul. 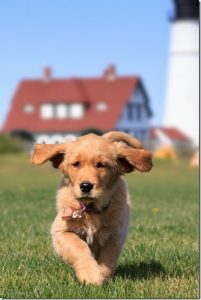 They come from genetic lines that formed the foundation of the Golden Retriever breed! They are truly loving dogs that live to be loved, and will be a pleasure for you to work with. Over the years, we have developed many friendships with happy owners and quite a following on Facebook. You will find lots of pictures of Goldens to enjoy, and important questions and discussions about food, health, play, and events. 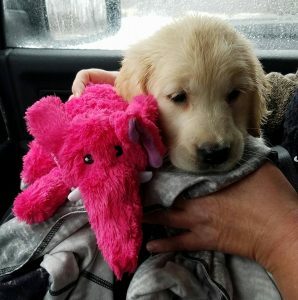 Do you want a Goldenridge puppy? First is to talk with us. Please call us. If you wish to proceed, you will then need to fill out our puppy application form. We will need to know more about you, your requirements, and your puppy’s new home. The all puppies are sold with AKC limited registration papers and with a spay and or neuter contract. Once we receive the spay and neuter Certificate from you or your veterinary, we will then mail you your AKC paperwork. Everyone whom purchasing a pup from Goldenridge Kennels will receive a copy of Chapter 745 ‘’Sale of Dogs and Cats’’, which is from the State of Maine / Department of Agriculture. Our puppies are guaranteed in accordance to the above mentioned Chapter 745. Sub-section 4155 of the Maine State Law of the Sale of Cats and Dogs. If a situation comes up for you (for example-health issues or job loss) or us or our female dog (for example a false pregnancy or dog does not cover – split heat or silent heat. Some dogs which get bred don‘t always cover) then your deposit will not be refunded but will be applied to the next upcoming litter or another litter of your liking within the next 2 years. You d o not loss your deposit. Deposits are non-refundable. There are no exceptions. Estimated heat cycles of a female (meaning if the female comes into heat 6 months from her last cycle) can come into heat anywhere between 4-9 months after their last cycle and this is considered a “normal heat cycle” – a cover doesn’t always guarantee a breeding/pregnancy. Meaning if a d og gets bred they may not get pregnant. Also, a dog can get bred and have a split heat and therefore produce no pups. The female usually comes back into heat a few months later. While the pups are in our care for 8 weeks we will make all medical decisions for the pups in conjunction with our veterinary regardless if the pups have a deposit on them only or are paid in full. Veterinary treatment if needed with be provided for the best interest of all pups.